The Great Rivers Lincoln Coffin is the official coffin for Reenactment Ceremonies in Springfield, Illinois on May 2-3, 2015. It was produced by a consortium of local history organizations to participate in the commemorative events for the 150th anniversary of the return of Abraham Lincoln’s body from Washington, D. C. to Springfield, Illinois, the 16th President’s final resting place. The Great Rivers Lincoln Coffin can be previewed and photographed at Farley Music Hall in Elsah, Illinois, Thursday, April 9, 2015 at 10:15 in the morning. The timing for this opportunity is relevant: April 9 is the 150th anniversary of the surrender of Robert E. Lee to Ulysses S. Grant at Appomattox, Virginia. This is a photo opportunity as well as an opportunity to meet project committee members who will describe the making of the coffin. An Abraham Lincoln reenactor will provide a ghost-like presence. President Lincoln’s Washington undertaker, Mr. Frank Sands, will make an appearance to describe briefly the Lincoln funeral. The coffin will be draped with an 1865 American flag which will be removed and folded by an honor guard of veterans of the military services of the United States. The project was a voluntary effort for committee and its many partners—Mosby Woodwork of Grafton, Illinois, who fabricated the coffin; Federal Steel and Erection, East Alton, Illinois, which provided schematics for the coffin dimensions; Fehlig Brothers Lumber Company, St. Louis, Missouri, who provided the lumber for the coffin; Brooks Brothers, Ltd. of New York City, who donated the black wool broadcloth that covers the entire coffin; Batesville Casket Company, Batesville, Indiana, who donated decorating and assembling services and materials to finish the coffin; Annin Flagmakers, Rosewood, New Jersey, for providing a replica of the 1865 flag to drape the coffin;, and Elias, Kallal & Schaaf, Alton, Illinois, who donated transportation services and storage facilities. Representatives of the partners will be available for questions and interviews. On May 2, 2025, near the Amtrak Station in Springfield, Illinois, the Great Rivers Lincoln Coffin will be removed from a replica of the Lincoln Funeral Train Car, placed ceremoniously in a waiting replica hearse, and then processed through the streets of Springfield, led by President’s Lincoln’s Own Band and followed by several hundred military and civilian reenactors to a site where the coffin can be viewed as part of an overnight candlelight vigil. 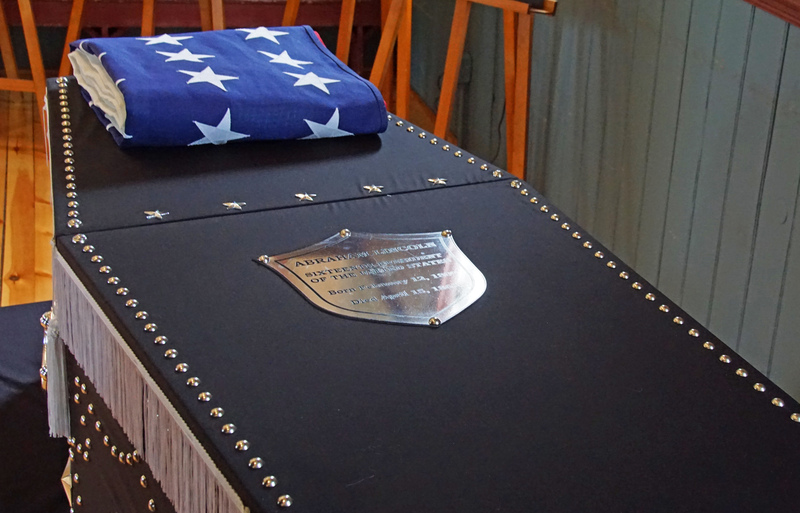 The hearse and coffin will process to Oak Ridge Cemetery the next afternoon, May 3, 2015, for final ceremonies. Please put this press conference on your calendars. For more information, please contact Tim Tomlinson at 618.513.7119.